The Natural History Museum of Los Angeles County (NHM) in Exposition Park is one of the preeminent natural history museums in the country with extensive research branches that continually expand the collection. Highlights include the Dinosaur Hall, the Gem and Mineral Hall, the Insect Zoo, animal habitats from Africa and North America, and the hands-on Nature Lab and Discovery Center. The Los Angeles County Natural History Museum is located next to the California Science Center and the California African American Museum. Exposition Park is across the street from the University of Southern California. Time needed: Minimum 2 hours for a walkthrough, up to a full day if you read the text panels and interactive displays, play around in the Nature Lab and attend any shows or special activities. NHM originally opened in Exposition Park in 1913 as the Los Angeles County Museum of History, Science and Art in the domed brick building that is now the east wing of the current museum. The museum was expanded to approximately double its size in 1920 and doubled again in 1927-30. An auditorium was added to the west end in 1958-60 and a north entrance and fountain were part of a major expansion in 1976. The glass Otis Pavilion, which is the current north entrance, a new Nature Garden and a separate ticket booth off the new parking garage were added in 2013 for the museum's 100th birthday. When the museum opened in 1913, they had a hard time coming up with art to exhibit in the art wing, but by the 1960s, the County's art holdings were substantial enough to warrant a separate museum. The art component was moved to what is now the Los Angeles County Museum of Art (LACMA) on Wilshire Boulevard, and the name of the Exposition Park museum was changed to the Natural History Museum of Los Angeles County (although the name on the front reads Los Angeles County Museum of Natural History). The museum had been given exclusive rights to retrieve fossils from the tar pits at Rancho La Brea when it first opened in 1913. In 1976, this collection had become extensive enough to merit its own building, so the Page Museum was constructed in 1977 at the La Brea Tar Pits over on Museum Row near LACMA. Becoming Los Angeles is the most recent permanent exhibit hall addition, replacing the California History and American History exhibits. It focuses on 500 years of the history of the Los Angeles Basin from the Tongva Indians through the Spanish Missions and Mexican Ranchos through the early American Period, the Great Depression and World War II up to the present day. The Dinosaur Hall houses one of the most extensive collections in the world, with 20 mounted dinosaur skeletons compiled from 80% real fossils. One of the most prized displays is a growth series of Tyrannosaurus rex skeletons including a baby, a juvenile, and an adult T-rex. 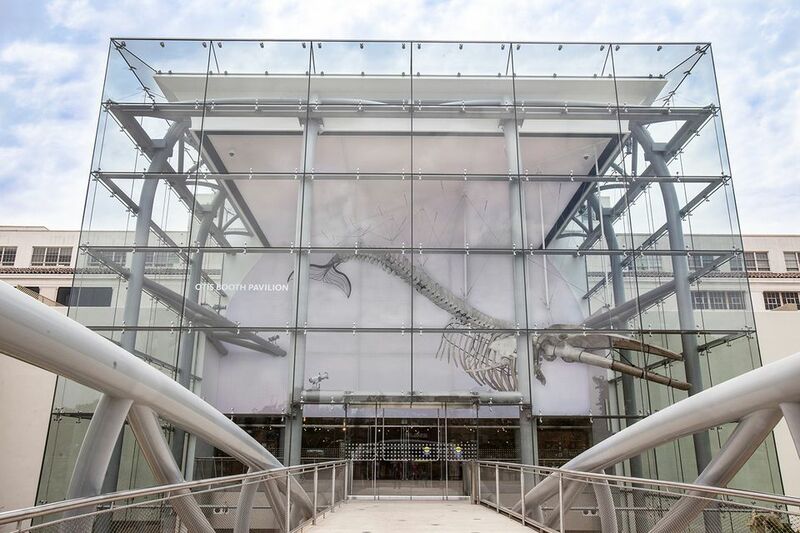 The Fin Whale Passage features a restored and rearticulated fin whale skeleton, the second largest species on earth. The whale, acquired by the museum in 1926, was sent for conservation in 2006 after being continuously on display since 1944. It contains 221 individual bones. In the restoration, a sculpted tail fin was added to give a sense of what the 63-foot marine mammal might have looked like in all its grandeur. The Habitat Halls at the Natural History Museum showcase the wildlife of North America and Africa in realistic dioramas with backdrops painted by famous mural artists. The Age of Mammals features over 240 specimens including 20 mounted mammal skeletons and taxidermy specimens of modern animals illustrating the evolution of mammals over 65 million years. One of the marine mammal fossils, the Aulophyseter morricei, a small sperm whale, is the only one of its kind on display anywhere in the world. The Hall of Birds presents winged creatures from all over the world including over 400 species of birds from Southern California that hold still long enough for you to get a nice close look. The Gem and Mineral Hall displays over 2000 specimens, from micro-crystals to meteorites. One ​prize example is a slap of jadeite that weighs hundreds of pounds. In addition to all the sparkly wonders behind glass, there are many items you can touch. Visible Vault: Archaeological Treasures From Ancient Latin America is a collection of ancient pre-Columbian ceremonial artifacts from the Americas. The Insect Zoo is a year-round exhibit that includes 30 terrariums and aquariums filled with an ever-changing selection of creepy-crawlies. The Discovery Center is a hands-on exhibit where visitors of all ages can touch and explore all kinds of artifacts from furs to shells, examine specimens under a microscope and re-assemble a saber-toothed cat skeleton from the La Brea Tar Pits. In addition to the permanent exhibit galleries inside the Natural History Museum, there are some temporary and seasonal exhibits. The Butterfly Pavilion is a seasonal exhibit set up on the South Lawn each spring and summer in a temporary structure. More than 55 different butterflies and moths go through their lifecycle on public view. Visitors walk through the butterfly habitat surrounded by the fluttering creatures. The Spider Pavilion replaces the Butterfly Pavilion on the South Lawn for 6 weeks in the fall. Spider species from around southern California and the world are spinning their webs throughout the pavilion and staff members provide spider-handling and feeding demonstrations. The Dino Lab on the 2nd floor of the Natural History Museum is not exactly seasonal, but sometimes the paleontologists are elsewhere, and not working in the lab, so there's not always something to see. But when they are in, you can watch scientists at work cleaning and studying fossils from the Dinosaur Institute expeditions. The Los Angeles Natural History Museum has a wide variety of programs for all ages. They range from tours and presentations within the museum to summer camps and overnight stays at both the Natural History Museum and the Page Museum. Seasonal events include Summer Nights in the Garden, First Fridays @NHM science discussions, DJs and food truck nights. Daily programs include Live Animal Encounters, Nature Walks and Gallery Tours. Dinosaur Encounters with life-size dinosaur puppets take place on Thursdays, Saturdays, and Sundays. Some programs are free with admission. Others require a separate fee and reservation. The NHM Grill in the basement provides hot sandwiches, salads, soups, pizzas, and pre-made cold sandwiches. There are additional fast food and finer dining choices next door inside the California Science Center. Picnic areas: There are several picnic areas around the Natural History Museum, including the Rose Garden to the west, the Jesse A. Brewar, Jr. Park to the East, and the South Lawn. Note: Food and beverages are not allowed in the museum galleries. The main Museum Store is on Level 1 near the North Entrance on the opposite side of the building from the Main Entrance. There is another dino-centric gift shop next to the Dinosaur Hall. When the Spider Pavilion or the Butterfly Pavilion is open on the South Lawn, there is also a small specialized gift shop there. The NHM is a wheelchair accessible facility. Wheelchairs are available on a first come, first served basis at the admission desk. Baby changing stations: In men's and women's restrooms on Level G, family restrooms on Level 1, and all restrooms on Level 2. This information was accurate at the time of publication. Check the museum website for the most current information. Prioritize and break up the day - There is a lot to see and do at the museum and it's easy to develop museum fatigue. Prioritize which exhibits are most important to you and see those first. 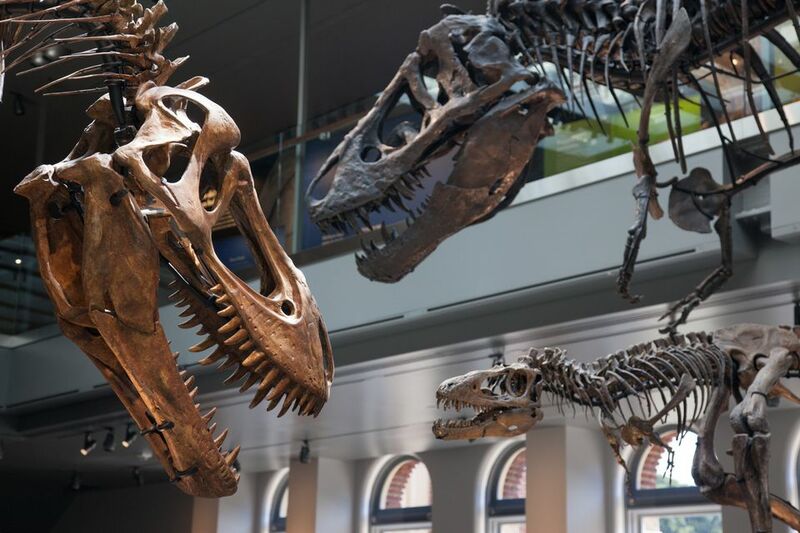 If you're visiting with kids, break up the day by spending time in the Discovery Center (where they can sit down for some activities), seeing the Dinosaur Encounter Show, having lunch or a snack and letting the kids run around the park next door in between looking at exhibits. A Visitors Guide with a map is available at the Admission Desk. Beat the crowds - Weekends, holidays, summer, and school breaks are most crowded. Most class field trips are Wednesday through Friday mornings, so those are also busy times, especially in Spring. To beat the crowds, go first thing in the morning, weekday afternoons, or Monday or Tuesday mornings. Free First Tuesday - With some exceptions, the first Tuesday of the month is usually free admission, which also makes it the busiest day of the month. If the cost of admission isn't an issue, pick another day of the month to visit. Although admission is free on first Tuesdays, parking is never free. Ward off the chill - Some of the galleries are kept quite cold, so you might want to bring a sweater, even in the middle of summer. Have a picnic - It can be hard to be inside all day on a nice day, so it's nice to take an outdoor lunch break. You can't bring outside food into the museum, but you can bring a cooler in your car and have a picnic lunch break in the Rose Garden or at the park on the west side of the museum. You can also grab sandwiches from the NHM Grill, or run next door to the California Science Center to Trimana Grill, Market and Coffee Bar. NHM's Dinosaur Hall has the only known fossil of the smallest dinosaur ever discovered, the Fruitidens haagarorum, which was about the size of a chicken. The museum's Gem and Mineral Hall contains the Mojave Nugget, at 156 troy ounces, the "largest gold nugget in captivity," as well as specimens of Benitoite, the state gem of California, and the world's largest sinhalite, a cut gem from Sri Lanka. The oldest items in the Natural History Museum are 4.5-billion-year-old meteorites. In the North American Mammals exhibit, we learn that a polar bear's skin under his white fur is black. In the African Mammal dioramas, we find out that the Okapi, a relative of the giraffe, has a foot-long blue tongue. The Aulophyseter morricei skeleton in the Age of Mammals exhibit is the only specimen on exhibit in the world of this ancient sperm whale. In the Insect Hall, among thousands of species, you can see scorpions, one of the oldest terrestrial forms of life on earth. The background paintings in the Africa and North American mammal dioramas were painted by famous artists of the 1920s to the present including Robert C. Clark, Charles Abel Corwin, Florence Bryant MacKenzie, Frank J. Mackenzie, Clark Provins, Hanson Duvall Puthuff, Robert Russell Reid, and Duncan Alanson Spencer. Although the museum has always been operated by the County of Los Angeles, the land the original museum sits on is owned by the State and the land the newer extension was built on is leased from the City of Los Angeles, so you're moving from City property to State property when you walk through the museum.